Southern Illinois University Press, 2011. Track 1, appropriately titled "Groove: Synchronizing African American Rhetoric and Multimedia Writing through the Digital Griot" recognizes other modern griotic figures (stand-up comics, spoken word poets, and preachers to name a few) and rests on the possibilities of the DJ as a storyteller who could open up discussions about how African American rhetoric can help cultivate meaningful, engaged, and culturally responsible instruction and use as it relates to technological access for all students, with a slant toward African American students. 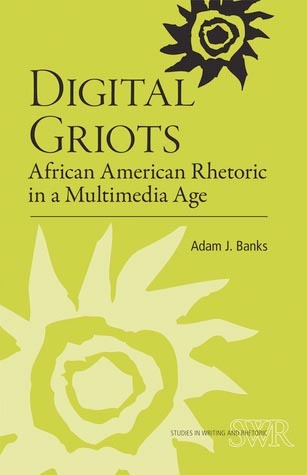 Banks says that the "digital griot, an amalgamation of [many] figures, offers a useful model for conceptualizing black rhetorical excellence bridging print, oral, and digital communication" and that the "digital griot has much to offer teachers-scholars in literacy and composition looking for relevant models of multimodal literacies for their work" (25,27). Not only does Banks say that the trope of the DJ will be great for scholars-teachers to engage multimodality, but he argues that African Americans should embrace this "griotic tradition to their engagements with technology, becoming digital griots, bearers of the tradition in digital spaces" (27). Banks's first chapter vies for the possibilities of digital participation for African Americans and presents a case for the importance of historical understanding. During Interlude 1, Banks recognizes the work of digNubia, created by Ronald Bailey. Bailey's digital griot project helps youth to make connections between the humanities and science.